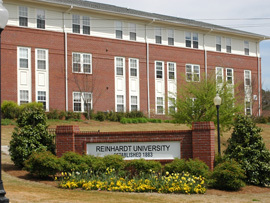 The Reinhardt community feeling begins in the residence halls, where business students live side-by-side with art students, where a student from India experiencing his first winter is sharing a room with a water-skier from Georgia. 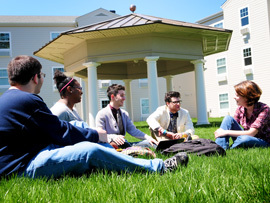 Our residence halls are characterized by the diversity of students living here; many of them are first-year Reinhardt students like yourself experiencing each others' cultures. Click here to see the housing costs. For returning and transfer students we offer the opportunity to live in our apartment style residence halls, the East and West Apartments. 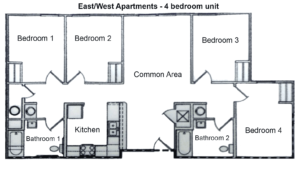 We offer both 2 bedroom and 4 bedroom units. All apartments are fully furnished and come equipped with a common area and full kitchen. 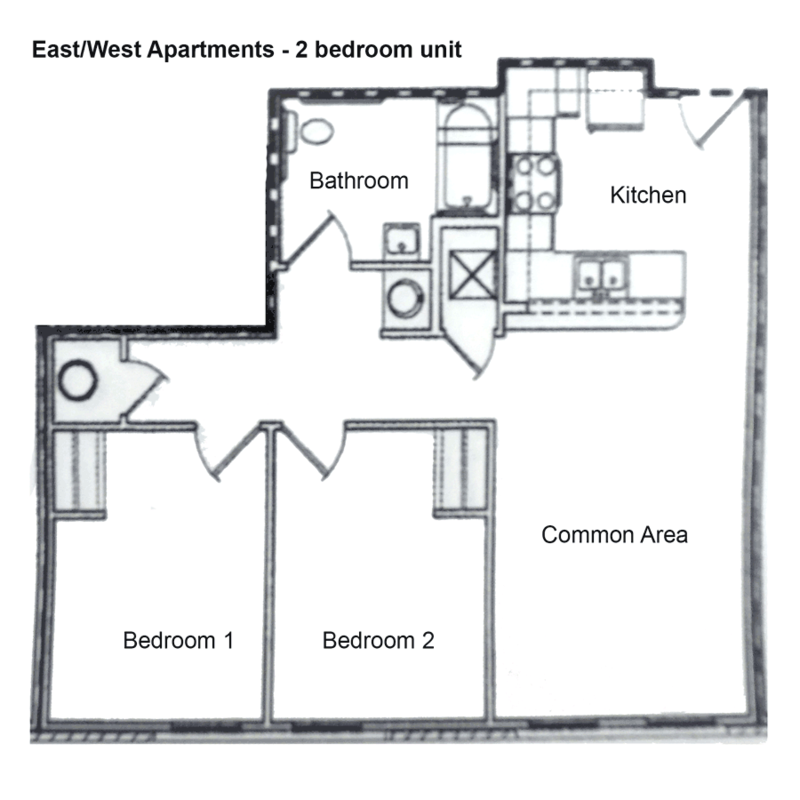 The apartments are only available for upperclassmen students that have a GPA of 2.75 or higher. All apartments have a full kitchen which includes a refrigerator, stove/oven, microwave, and sink. Living rooms are furnished with a couch, chair, entertainment center, coffee table and end table. Each bedroom will have a full-size bed, nightstand, desk with chair, and a dresser. Campus laundry facilities provided at the cost of $1.25 per load for wash with a 35 minute cycle and $1.25 per load to dry with a 60 minute cycle. 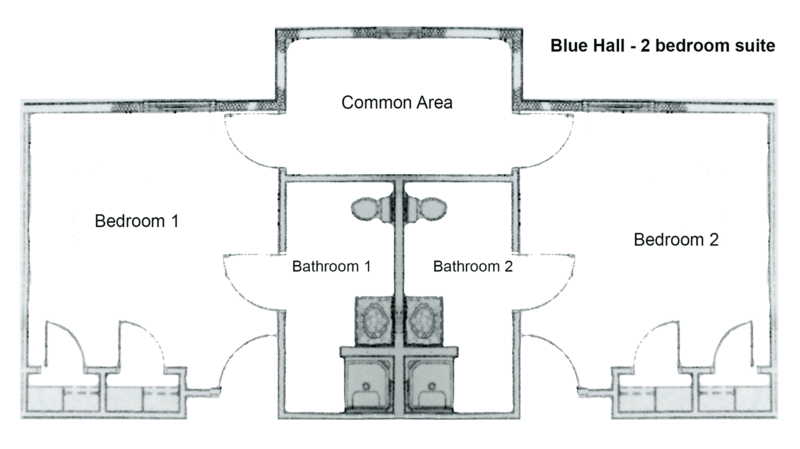 Blue Hall accommodates 44 residents and is designed to house male students. 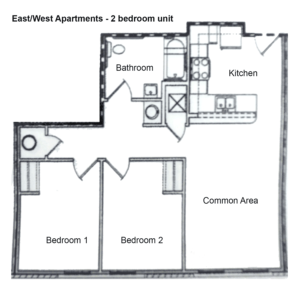 Each floor has security entrances while accommodating 12 to 16 residents. Double occupancy rooms share a common study lounge in a suite style arrangement. Each double occupancy room has a private bath. Blue Hall also houses an Area Coordinator who serves as a professional staff member. Laundry facilities are located at the main entrance of Hubbard and between Blue and Gold Halls. Rooms with ADA accommodations are available as well as private rooms when space allows. Campus laundry facilities provided at the cost of $1.00 per load for wash and $.25 per 15 minutes to dry. 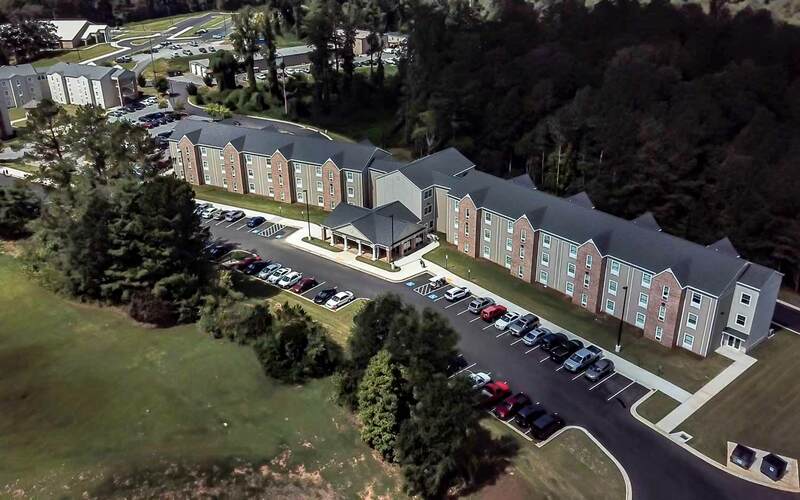 Eagles View can accommodate up to 192 first year male and female students in a suite style residence hall with double occupancy rooms. Eagles View has a laundry facility on the first floor. 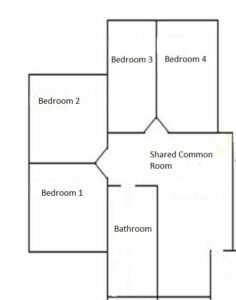 Double occupancy rooms in Eagles View have two beds, two desks with chairs, two dressers, and closet space for each student. Home to the Living Learning Communities:Education, Faith and Spirituality, Music/ Performance, and Honor's College. If you have any questions as to what a Living Learning Community is, please contact the Office of Housing and Residential Education. Campus laundry facilities provided at the cost of $1.25 per load for wash and $1.25 per load to dry. Gold Hall accommodates 44 residents and is designed to house male students. Each floor has security entrances while accommodating 12 to 16 residents. Double occupancy rooms share a common study lounge in a suite style arrangement. Each double occupancy room has a private bath. 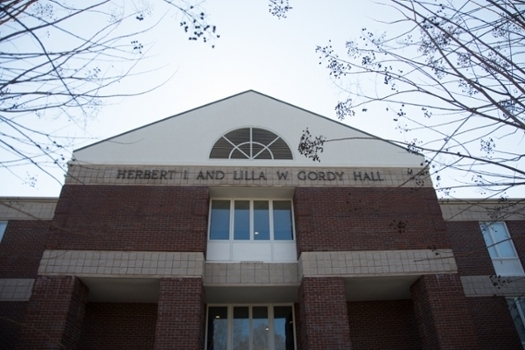 Gold Hall also houses a Residence Life Coordinator who serves as a professional staff member. Laundry facilities are located at the main entrance of Hubbard and between Blue and Gold Halls. Rooms with ADA accommodations are available as well as private rooms when space allows. Two TV lounges for the students to use and hangout. 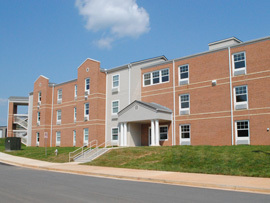 Gordy Hall can house up to 130 freshmen female students in a suite style residence hall with single and double rooms. 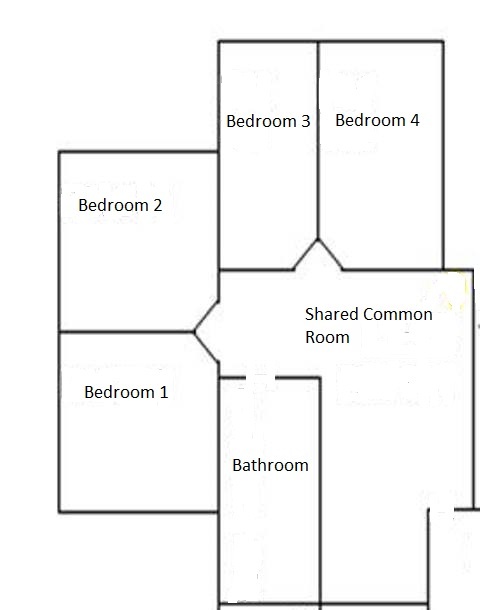 Each suite can hold up to eight students in four double rooms. 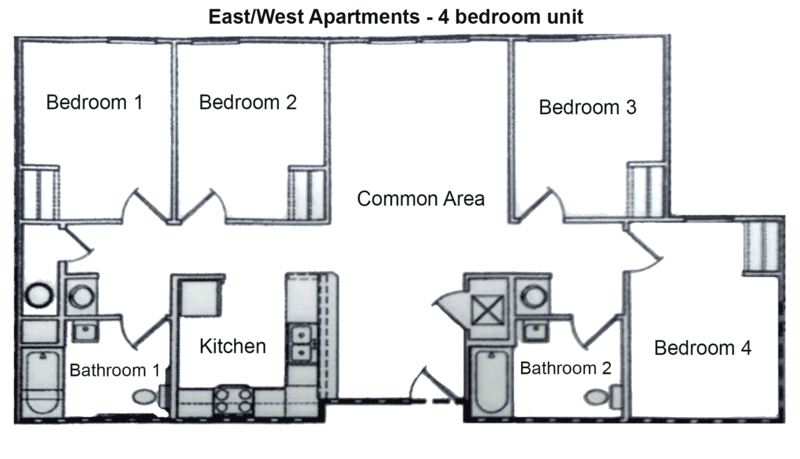 There is a bathroom in each suite and a common area furnished with a couch, loveseat, coffee table, and end table. Private rooms are located off each hallway and each room shares a connecting bathroom with another private room. Each student who resides in Gordy Hall is provided with a bed, wardrobe with drawer space, a desk, and a desk chair. There is a kitchen available for use on the third floor and laundry facilities on the first floor. There are three lounges for the students to use and hangout with a large screen TV in the fourth floor lounge. 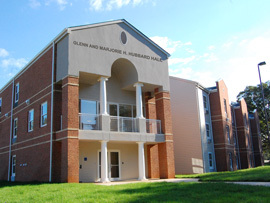 Hubbard Hall can accommodate up to 72 male students in a suite style residence hall. Hubbard provides private bathrooms for all residents with a shared study area that connects two rooms together, as well as laundry facilities on the first floor. Each Hubbard room have two beds, two desks with chairs, two dressers, and closet space for each student. which have built in shelving systems. 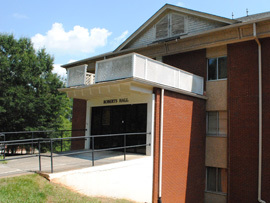 Roberts Hall can accommodate up to 41 upperclassmen male students in a suite style residence hall with double rooms. 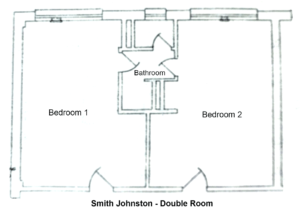 Each suite has a common living area with four double rooms. All residents in Roberts Hall are provided with a bed, closet, dresser, a desk, and a desk chair. 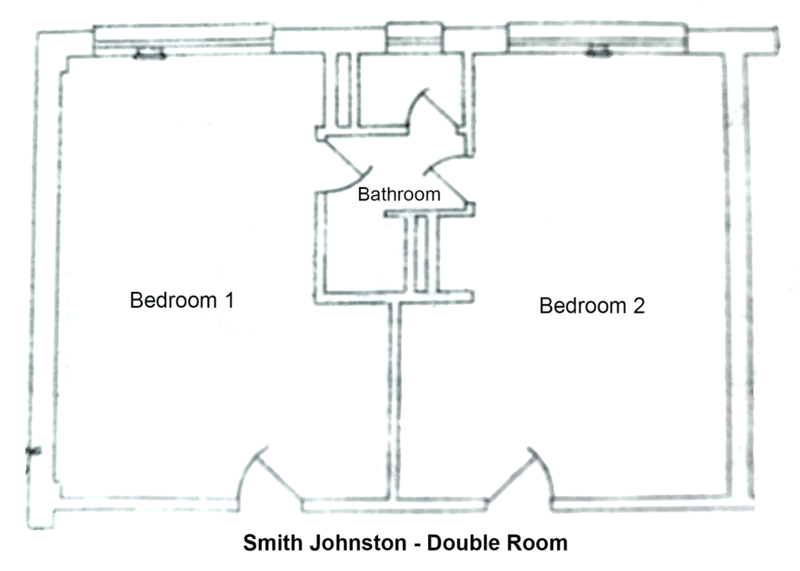 Each double room shares a bathroom with another double room. Laundry facilities are on the second floor. There is a TV lounge in the lobby with a large screen TV. Laundry facilities are on the bottom level of the building. 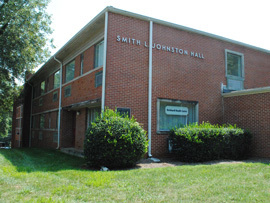 Smith Johnston Hall accommodates 48 upperclassmen male students in double rooms with adjoining restrooms. Each carpeted room is furnished with built-in closet and drawer space, two beds, two desks with chairs, and a sink. This building also includes a TV lounge that is connected with Paul Jones Hall. There is easy access to a nice courtyard and the laundry facilities are on the first level of the building.